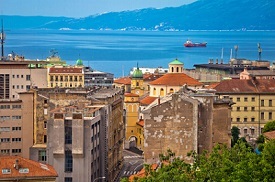 Rijeka is the third largest city in Croatia, and is filled with charm and culture just waiting to be discovered. The center of town is made up of beautiful Austro-Hungarian architecture while the outskirts of Rijeka consist of parks and promenades. There are many restaurants and cafes to choose from, as well as shops and markets for the souvenir hunter. Either by bus, by taxi, or by foot, the best way to see the city culture is through the tourist path that goes to the most important sights. Visit the Trsat Castle and the City Tower, or head to the Maritime and Historical Museum to learn about the history of Rijeka. Other attractions include the Kantrida pools, Rijeka diving, the Astronomical Centre, and Grobnik, an auto-moto track where you can drive like the professionals.